Game 5 of the NLDS is set for another pitching duel between the Dodgers and Mets, this time between Zack Greinke (left) and Jacob deGrom. 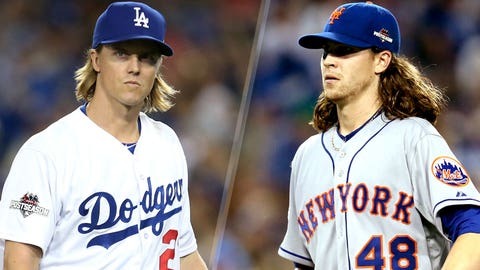 Two of the best right-handers in baseball, Zack Greinke and Jacob deGrom, will square off in Los Angeles for a winner-takes-all NLDS Game 5 on Thursday. Dodgers ace Clayton Kershaw, who led Los Angeles to a 3-1 Game 4 victory after being outdueled by deGrom in Game 1, gave his thoughts on the meeting of the two elite righties. "You know what, it’s probably dead even, to be honest," Kershaw said. In his first career postseason start, deGrom dominated the Dodgers, throwing seven scoreless innings while striking out a total of 13 batters and walking one. After deGrom won Game 1, Greinke won Game 2 with seven solid innings of his own, in which he gave up two runs and struck out eight. Greinke posted a 19-3 record with a 1.66 ERA and 200 strikeouts during the regular season; deGrom went 14-8 with a 2.54 ERA and 201 strikeouts in two fewer starts than Greinke. "As good as Zack is and has been the whole year, deGrom has been the same," Kershaw said. After his dominating Game 1 start in Los Angeles, the Dodgers have their fingers crossed that deGrom won’t be as sharp as he was last Friday. "Hopefully, he makes some mistakes, to be honest with you," second baseman Howie Kendrick said. However, despite a daunting encore against deGrom, the Dodgers like their odds in Thursday’s winner-take-all Game 5. "We’re really confident. We’re going home for Game 5 with Zack Greinke on the mound," utility man Kiké Hernandez said. "I think we’re feeling good about ourselves. It’s loser goes home. Their guy against our guy." Although the Dodgers were shut out by deGrom, they notched five hits off him. Kendrick knows it’s imperative that Los Angeles capitalize upon having runners on base in order to keep their postseason aspirations alive with a win against the Mets on Thursday. "It comes down to, when you have runners on, can you capitalize with them on and it’s a matter of if he makes any mistakes and gives you pitches to hit," he said.